Come November 3rd week this year, a billion aspirations filled PSLV-XL would be roaring into the skies of Bay of Bengal from a sleepy town of Sriharikota in the Indian state of Andhra Pradesh. It was also mentioned in some occasions (unofficially); as the target is Mangal the planet mars and hence the space craft, yaan in Hindi named Mangalyaan. Nobody had ever thought that when the then Prime Minister Sri Atal Bihari Vajpayee (with a think tank comprising of one of the most popular presidents, Dr. A.P.J. Abdul Kalam) declared that India will aspire to go to the Moon in his inspirational speech from the Red Fort in Delhi on 15th August (2003), it will be a giant leap for the Indian space community and for that matter for every Indian. What a success it was for Chandrayaan , the maiden Indian attempt to the most lovable heavenly body. 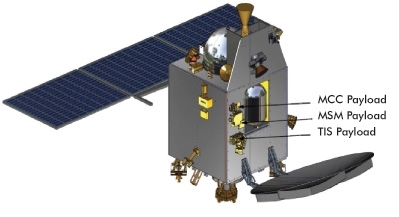 India had lined up its space probe (2008) along with SELENE (Japan, 2007), Change (China, 2007) and LRO (USA, 2009). When reaching the moon itself was a great challenge to the aspiring ISRO scientists/engineers the discovery of of water on the moon, call it a century class discovery was achieved. How was it possible? It was all due to a set of very major decisions taken by the senior scientists (officials @ ISRO) who chose to offer a free ride to more than 50% available slots (six out of eleven) to the moon. Vow... it indeed worked. For the first time in the history of space exploration an aspiring nation invited the best possible instruments (without any bias in selection, again credit to ISRO) across the globe to be part of their mission. As a member of Chandrayaan science team, the author had collected along with a group of scientists an appreciation award for this effort, given by the International Astronautical Society at the International Lunar Exploration Wroking Group (ILWEG) Meet at Sorrento, Italy, 2007. An attempt is made here to predict what is in store for ISRO's MOM (Mars Orbiter Mission) ; in terms of crucial science goals. Though Ms. Emily Lakdawala (author: Popular Astronomy / Space related articles on the internet) chooses not to call it MOM, for us here in INDIA, it would be literally the mother of all attempts to a nation bubbling with immense confidence post Chandrayaan-I success. Being a first step into planetary world, MOM faces enormous challenges in terms of propulsion, facing hard space environment for 10-months, meticulous planning as far as mission control is concerned; however the present report only deals with the major achievement MOM can grab as far as the presence of instruments in its kitty are concerned. The experience gained by participation of the author in developing the FIRST Indian science experiment (CHACE) reaching lunar soil, will all be employed (in this blog) in bringing out the potential of Mangalyaan as an exploratory probe. The uniqueness of ISRO is: highly motivated staff who have got another cracker of a mission at hand, of course, each and every staff would fight like a solder and would rise to their potential by giving their best shot in accomplishing the goal. History is mute spectator to the enormous challenges accepted by their mentors when the very first attempt to reach the space was a failure (SLV-3D1, August 1979); they rose like a phoenix in attaining success within a span of 11-months (SLV-3D2, July, 1980). Today, though the nagging issues of GSLV plaguing, but the unprecedented success they have been achieving in the form of impeccable record of PSLV and dropping their TRI-COLOR (national flag) on the southern pole of moon are certainly have been motivation for ISRO. As we approach November, a celestial window opens up the opportunity to catch up with planet Mars. Much before leaving the earths proximity, there are indications that the Mars weather will be corrupted with the approaching Comet. In a recent news report (DNA, Nirad Mudur, April-8, 2013 ) and by Emily Lakdawala ( Will Comet Siding Spring makes meteor shower on Mars? ), it is predicted that a comet is approaching Mars whose tail may swarm the atmosphere of Mars. Though both the project director, Mr. Annadurai and Prof. U.R. Rao were upbeat about the development of activities of MOM, Prof. Rao goes on to say that even if it amounts taking a risk, it is worth. In the author's view, it would be a unique opportunity to study the Planet-Comet system in tandem; of course the probe would bring post comet visit data which would show interaction between the tail of the comet and Martian atmosphere. Hence for a country like India, which has invested every available resource (~ $ 80 million) in putting up a great maturity in catching up with the celestial event, the Comet news should not be a deterrent. Lets be honest, having worked so hard to reach Mars in this available window any step backwards would mean MAVEN the US probe specially designed to study the Martian atmosphere would take away a huge piece of pie from the intended achievable goals of MOM. A lost opportunity in this window also means we will be lining up alongside China and Russia in next available window to Mars. During the writing of this article (3r week of April, 2013) another report contradicts the effect of Comet Siding on Martian atmosphere (Comet Siding Impact-ruled out ), also quoting Mr. Radhakrishna, chairman, ISRO that their preparation are ON for MOM. Lets hope that Comet Siding will only be a stunning spectacle up in the skies while MOM was probing Martian atmospheres. 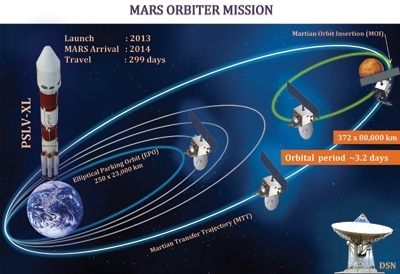 From the information available in ISRO's annual report 2013 (ISRO-Annual Report); ISRO plans to have their FIRST ever planetary exploration, Mars Orbiter Mission to be placed in a 372 by 80,000 km orbit. In verbatim (Courtesy ISRO) The primary driving technological objective of the mission is to design and realize a spacecraft with a capability to reach Mars (Martian transfer Trajectory), then to orbit around Mars (Mars Orbit Insertion) which will take about nine months time. Yet another technological challenge is to realize related deep space mission planning and communication management at a distance of nearly 400 million km. The MOM would have a ride on the intended PSLV rocket which would place the space craft in a 250 X 23,000 km orbit with an inclination of 17.3 degree. Again, as ISRO sources anticipate, the critical demand is going to be on the critical mission operations, stringent requirements on propulsion and communications. Keeping with ISRO's strategy of allowing every crucial decision to be scrutinized through an expert committee, the ADCOS (Advisory Committee for Space Sciences) has cleared a set of 5-instruments taking just around 15-kg out of the lift off weight of around 1,350 kg of MOM. The only information available on the public domain on the payloads is a paper published at 44th Lunar Planetary Science Conference, 2013 ( LPSC-2013) Texas, USA. The Published abstract ( Goswami JN, Radhakrishnan K ) gives a limited amount of information on the five payloads. A first cut look at the list of instruments one can make a safe comment that the MCC (Color imaging camera) and MENCA (the quadrupole mass spectrometer) are the technologies which are within the purview of ISRO. The idea of making this statement is not to take away the complications involved in each missions goals and unique challenges in withstanding the extreme harsh space environment; but to make a point which would emphasizes the opening of new technological fronts where a fresh beginning has been made in the MOM project. TIS (thermal imaging spectrometer), is a fresh initiative for ISRO. The only information available on this instrument is: a reasonable size array of 120X160 elements based bolometer is chosen for this payload. While the Lyman Alpha Photometer is a new class of instrument in the kitty of ISRO's vast resources. The recent experience in the conceptualization of UV sensor (along with the the absolute intensity calibration facility which is already in place) for the ASTROSAT mission would have been helpful in developing the final product for MOM. The most intriguing instrument is MSM the Methane sensor. However, for ISRO this got to be the front runner in their scientific pursuit in hunting down the spatial variation of methane over the Martian atmosphere. For MSM the information available is that a Fabry-Perot etalon based system with the frequency and sensitivity tuned to match methane measurements The bottleneck, in authors view, is certainly going to be the heavy demand on the achievable sensitivity for MSM. MENCA (Mars Exospheric Neutral Composition Analyser) is a quadrupole mass spectrometer (QMS) covering 1-300 amu (atomic mass unit) range with a mass resolution of 0.5-amu. The uniqueness of this instrument is its ability to measure 10(-14) partial pressures prevailing in its ambiance. The author has a first hand experience in developing a similar instrument ( CHACE ) as a team leader. The preparation of CHACE (CHandra's Altitudinal Composition Explorer ) has been a unique FIRST time experience for all the 5-6 young aspiring Scientists / Engineers. 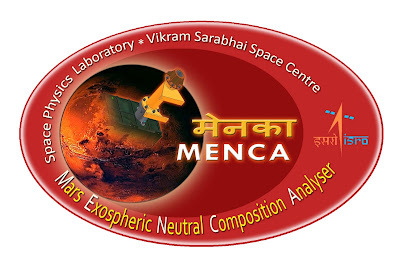 As the word heritage carries a very respected value in ISRO, the MENCA has an excellent heritage; where its ancestor has been responsible for bringing a radical shift in the assumption of bone dry moon concept to a prevailing total pressure measurements of 10(-7) torr, whose particle densities amounts to 10(+10) particles/cc; at the the same time various other gaseous species with partial pressure values in the range of 10(-10) torr corresponding to particle density of 10(+7) particles/cc were detected unambiguously. N.B. : The views presented here are only that of author. No other official source (from ISRO or affiliated centers) has been consulted in arriving at the above said discussions. The authenticity of authors participation in the past mission is reflected from his published work; few details presented on the present development of the hardware (in MOM) are all taken from the public domain. However, the other comments on the prediction of mission outcome is purely on the scientific merit of the experiment (made by the author), by no mean an authoritative statement. As and where the material is taken from the public domain, an appropriate credit has been offered.